Athens welcomed me with a powerful storm, streams flowing down its streets and train workers strike. I came to hike on Crete but planned to have one day to see the Greek capital. I’d never been to Greece before that and wasn’t sure what to expect. I knew I wanted to see the most important remnants of the ancient city but had no time to properly research anything. And I think it turned for the good. I had only basic memories of what The Acropolis looked like from old history books. I started to walk through Athens up north as I had to buy a gas canister for my camping trip. I walked a few different districts before finally reaching the oldest parts of the city. The first time I noticed the Acropolis up the rock rising some 150 m above the rest of the city, I was really surprised. I knew the Acropolis was on a hill but seeing it with my own eyes was something completely different. The hill seemed gigantic, much higher than the 150 m it really has. It rules above the whole area and demands everyone’s attention. After the heavy rainfall the night before, this day cleared and offered fantastic sunny weather for January. I moved towards the imposing rock and simply followed the tourists. Navigating the small streets and steep stairs is an adventure in itself. I reached the Areopagus (Mars) hill on the way to the Acropolis and climbed it for stunning views of the city below and the Parthenon. What a fantastic vantage point! After walking around it for a few minutes and taking photos I continued to the main entrance. I was lucky that the basic entry ticket was half the price out of season. Coming in January generally means fewer crowds. I can only imagine how crowded the hill must be in the summer – the place was busy with tourists, although, thanks goodness! not overwhelmingly so. The skies were getting dark again offering a dramatic backdrop to the marble shapes of the ancient buildings. No pictures in history books could prepare me for the view. The scale of the Parthenon floored me. I was amazed by the beauty of its perfect geometry and grandiose shape. I am glad I could see the results of the restoration project started in the ‘70s of the last century. I wandered around, trying to catch every angle of the buildings. 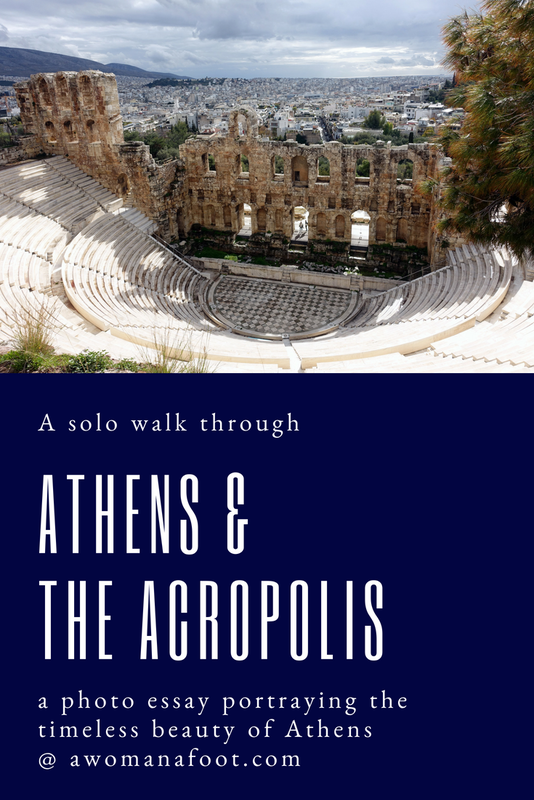 After the initial jaw-dropping experience of seeing the Parthenon, I moved to another stunning shape – the Erechtheum and the Old Temple of Athena. Placing of this temple was just perfect – with the backdrop of pure skies and the entire city down below. After a long time of wandering and taking photos atop the hill, I moved on to explore its slopes. The path takes you all around it and is not as popular as the rest of the rock, so there hardly were any people there. If you start with the southern side, you reach the Theater of Dionysus Eleuthereus. Fantastic structure, with its steep walls of seats on three sides. If you have the time, walk around the hill and enjoy views to the city on all sides. It was a lovely stroll and I hardly met anyone on my way. I had some time to wander around so wander I did. I was charmed by the tiny chapels found in the most surprising places, including parking lots or under a hotel's entrance. I loved all the other ruins of ancient glory and tried to imagine what the life was like thousands of years ago, when Athens were at its finest. A few hours later, when it was getting close to sunset, I decided to walk up the hill again in hopes of some spectacular views. It was a bit too cloudy to for that, unfortunately, but this time I took a different path and it lead me through a fantastically charming labyrinth of narrow paths. Those are the moments I love the best - when I "lost" myself in a foreign place and discover places as if I was the first person to ever do it. I know this path is described in every guide there is but how much more fun when you find it yourself? Find your accommodation in Athens today! The sun set and I was ready to grab my big backpack from the storage and head for Piraeus where I could catch my ferry to Chania. I really enjoyed this a bit chaotic and plan-less walking, as I was able to feed my eyes with beauty on my own pace. Have you had a chance to visit Athens? What was your first impression of the Acropolis?